Friends of Family Farmers is excited to announce the return of four InFARMations in Portland this year, all celebrating pastured meat and dairy. There is a lot of confusion for eaters around the definitions and practices of pastured proteins: pastured vs. free range vs. organic vs. grass fed, etc. 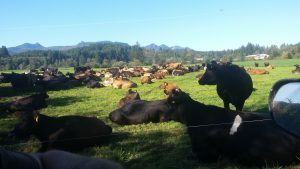 Come hear directly from farmers and ranchers from the Oregon Pasture Network as they tell their farm stories and give you all the information you’ll need to be an educated consumer of pastured meat and dairy products. Other panelists will include chefs, processors, butchers, doctors, and policy makers. 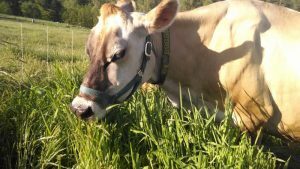 This month’s InFARMation will focus on pasture-raised dairy on November 13th at Lagunitas Community Room. Mike Guebert, family farmer/owner at Terra Farma, where along with his wife Linda they farm pasture-raised raw milk, eggs, and meat, and sell directly to the consumer. Mike Grauwen, family farmer/owner at Onion Peak Dairy in Nehalem, milks 200 cows for Organic Valley co-operative. Ivan Maluski, policy director of Friends of Family Farmers. Kathleen Bauer, food writer at Good Stuff NW, whose article about the connection between Tillamook Cheese and the beleaguered mega-dairy Lost Valley went viral. Doors open at 6pm, speakers start at 6:30. This is a free, all-ages event. Beer sales will be donated to Friends of Family Farmers. Please note – food options will be limited: Pasture-raised pork rolls and Spinach & Feta hand pies. In addition to Lagunitas beer, there will be sodas and water. Parking is on-street, so leave yourselves a bit of extra time for that. Bring your questions about pasture-raised dairy and a healthy appetite for knowledge! If you can volunteer to help the events run smoothly and/or get the word out to folks about InFARMations, please email Michele@friendsoffamilyfarmers.org.